The city of San Jose has done an about-face on its illegal fireworks crackdown after handing out fines that were found to be questionable. The city came under fire last month for handing out $500 fines to purported violators with no more evidence to go on than a couple of complaints online. On Wednesday night, NBC Bay Area learned a lawyer representing some of the accused violators received a letter from City Attorney Rick Doyle saying San Jose will dismiss all citations that were based solely on online complaints and will reimburse all $500 fines that already have been paid. The move comes after two weeks of pressure from frustrated residents and attorney Jim McManis, who said the yellow citations that were issued with little or no investigation by the fire marshal were unfair. A possible turning point came Tuesday when resident Amy Guzules challenged the City Council. "Five hundred dollars is not easy to come by in my household," Guzules said during the council meeting. Mayor Sam Liccardo responded: "Before you are required to pay a fine, I believe the city manager's office will be reaching out to you to resolve this." 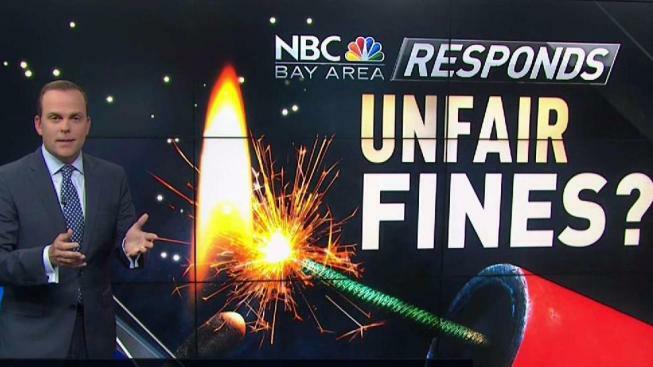 The City of San Jose did not immediately respond to NBC Bay Area's requests for comment. The office of Councilmember Sergio Jimenez confirmed the dismissal of fines. Jimenez, who met with constituients including Guzules on Saturday morning, said unintended consequences had surfaced in the city's effort to combat rampant illegal fireworks use. "I recognized that we needed to step back and thoroughly analyze the citation process," he said. "So I'm happy that we're able to dismiss the citation while we find better solutions."